A long time ago, I was invited to attend a conference held here in Boulder for fitness and health folk who blog. Much to my excitement, they offered to pay for my registration! 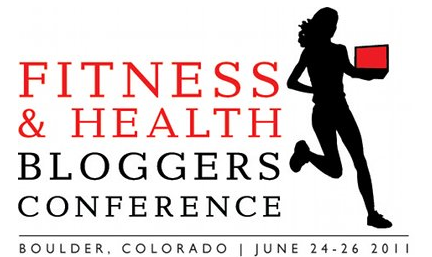 It’s a three-day conference (Friday-Sunday) called the Fitness and Health Bloggers Conference. I hope they don’t make us run and blog at the same time. That could be difficult. Anyways, how awesome, right? I’m stoked! I’ve been looking forward to this conference for multiple reasons. One, I’ve never been invited to a bloggers conference before so I’m excited to meet fellow bloggers who love doing what I love doing too: blogging about our active, healthy lifestyles! Two, there are all sorts of workshops and speakers and after-hours parties to attend. Three, I love blogging and anything I can learn to develop my blogging skillz will be awesome. If you happen to be going to the conference this weekend too, holler at me! I’d love to meet up with you! I hear there’ll be a “live bogging” sesh on Saturday, which I actually have no idea what that means. I’ve got this mental image of a big ol’ conference room filled with tens of people, typing away, all at the same time. Good thing I have a laptop. Too bad the battery is getting old and only holds a charge for like, an hour. I hope I’m seated near an outlet. I look forward to reporting back all the neat info I learn this weekend. So stay tuned for that! And again, let me know if you’ll be around for the conference this weekend! That sounds like fun. I’m not too sure what “live blogging” is, either. I’m strangely curious now! Erin, your blog rules the netscape!